The text of Geographike Hyphegesis by Claudius Ptolemy1 is a reworking of the original books (now lost) of Marinus the Tyrian. In Book 7 chapter 1, Claudius Ptolemy lists the sites which comprise the coastline of India from the Indus River to the Ganges. However the form of India which his map indicates is not reconcilable with a comparative geographical plot. Most of the maps of Claudius Ptolemy may be considered a reasonable representation of reality, but India is not. Research indicates that Marinus the Tyrian and Claudius Ptolemy utilised the Eratosthian6 length for the coastline for India, between 109°E and 148° 30’E. However it is evident they did not realise that the stadion2 length was an earlier version and not the 0.184Km utilised in their times. 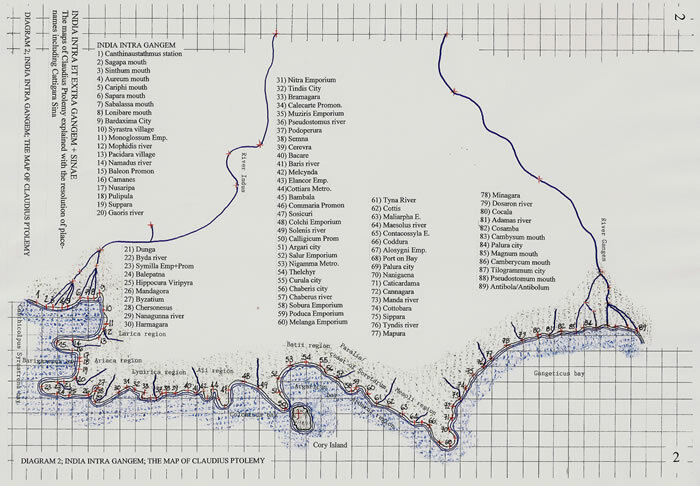 In Book 7, chapters 2 and 3, MT/CP list the sites from the Ganges Delta to Cattigara of the Seres. But, having stated that the limit of the oikoumene to the east was 180 degrees, Claudius Ptolemy was required to contort the littorals much as he had distorted Britannia and Scotland3. Claudius Ptolemy utilizes the details provided by Marinus the Tyrian, he adjusts some distances, generally those in the Middle or Far East, to ensure the length of the oikoumene, east/west, was no more than 180 degrees. Marinus the Tyrian had stated the length as 225 degrees. Analysis of the Mediterranean Sea4 and its lengthconcluded that as thelatitudinal degree determined by MT/CP was 500 stadia of 0.184Km, a distortion of the land masses was inevitable. That is evidenced by the fact that a geographical degree of latitude is 604 stadia of 0.184Km. To control this distortion the Mediterranean Sea was enlarged east/west by the inverse of a ratio well known to MT/CP, that of 36North, or 93:115. (This is sometimes called 0.8 or 4/5, and they are interchangeable in the MT/CP text.) Thus research has found that Mediterranean Sea was enlarged east/west from the Pillars of Hercules to Alexandria in Issus by the ratio 115:93. Marinus the Tyrian provided longitudes for the Mediterranean Sea which were accepted by Claudius Ptolemy, but the residue of the longitudes were amended as Ptolemy’s book 1, chapters 11 to 15 fully explain. “from the meridian passing through the Fortunate Islands, as far as the Sacred promontory of Spain 2° 30’, thence to the mouth of the river Baetis, and from the Baetis to the Strait and to Calpe is likewise 2° 30’, being one and the same distance; from the strait to Caralis, a city in Sardinia, is 250; from Caralis to the promontory of Lilybaeum in Sicily 40 30’; from Lilybaeum to Pachynus is 30; from Pachynus to Taernarus in Laconia is 100; thence to Rhodes is 8° 15’; from Rhodes to Issus is 11° 15’; from Issus to the Euphrates is 2° 30’; the sum of all these degrees is 720. Then were added the following; “from the Euphrates to the Stone Tower is 24 000 stadia or 60 degrees; from the Stone Tower to Sera, 45° 15’”. The text states,” adding the degrees which have been noted, they amount to 60 or 24 000 stadia. When we have added the 45° 15’ from the Stone Tower to Sera, the total distance from the Euphrates to Sera on the parallel of Rhodes will amount to 105° 15’”. Thus the oikoumene is 720 + 600 + 45° 15’ or 177° 15’. Chapter 12 ends as follows; “Hence, the length of the known earth, that is from the meridian drawn through or terminated by the Fortunate Islands5 in the extreme west to Sera in the extreme East is 177° 15’”. Thus with the Mediterranean Sea already wrongly drawn, i.e. it is actually 5° 20’W to 36E geographical, or 41° 20’, but given by as MT/CP 7° 30’ to 69° 30’, or 62 degrees, naturally the discrepancy in the number of stadia must be accounted for. The distances are 20197 geographical and 25079 stadia by MT/CP. Thus distortion problems could only increase the further east travelled. But if an analysis of the distance proposed by MT/CP between the eastern Mediterranean and the Indus River is made, a totally different picture emerges. In order to simplify the data, with the Indus Delta situate at 24N it is in order to calculate from an alignment point N/S, the Sinai Peninsula at 28N, rather than Issus at 36N. Thus from the Gulf of Aqaba to the Indus Delta on the Ptolemaic map is 66E to 109E, a distance calculated at 24N of 430 x 456.77 stadia or 19640 stadia. Geographically it is 34° 30’E to 68E, or 33.50 x 551.78 stadia or 18848 stadia. This may be considered quite reasonable and an attempt to portray geographic accuracy. It is a 6 percent inaccuracy and illustrates that the stadion of 0.184Km was utilised. However, if the Indian longitudinal measure is analysed, that is “India intra Gangem”, it is basically a 39° 30’ longitude from the Indus to the Ganges, which when calculated at 24N (as before) produces a length of 39.50 x 456.77 or 18042 stadia. The geographical calculation is Karachi to the Eastern Ganges Mouth, or 67E to 92E, 25 degrees of 551.78 stadia or 13794 stadia. This indicates an expansion by MT/CP of 1.308 or 150/115. 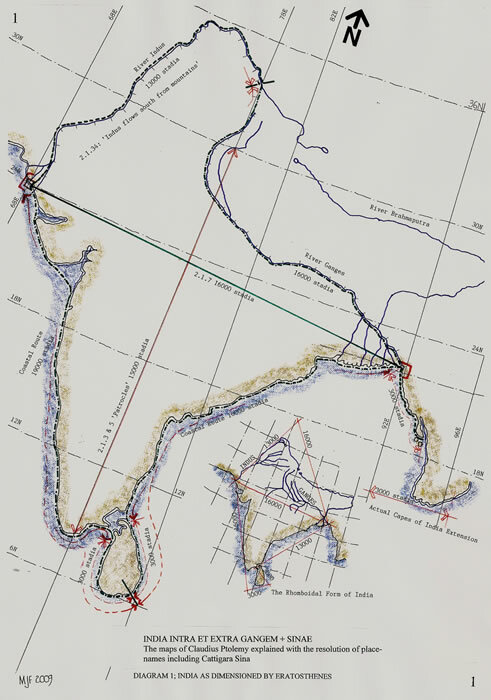 If the last sections are now analysed, book 7, chapters 2 and 3, ‘India extra Ganges and Sinae’, MT/CP state a longitudinal spread from 150E (18° 00’N), the limit of the Gangetic Bay to Cattigara Sinae, 177° 15’E (South 80 30’). That is 270 15’East, but 26° 30’north/south. The limit of 180 degrees for the oikoumene has intervened to produce a distortion of some magnitude. However, by a simple analysis of the coastal distances, the primary source and method of measuring distances as explained by MT/CP, both India intra, India extra and Sinae can be fully explained. But it is first necessary to indicate the information available to, and used by Marinus the Tyrian, in forming the maps which have been produced. Eratosthenes’ research is explained within the text of Strabo’s Geographia7, and the following are text references within those books appertaining to India. These apply to India intra Gangem only, as Eratosthenes completed his measure of the oikoumene at “The capes of India”. Although no doubt knowing there was land south of the equator in Africa he added 2000 stadia east and west as an insurance against an upset in the calculation of a 2:1 ratio, length/breadth of the oikoumene. 2.1.7 Length of India northern side which Megasthenes calls 16000 stadia, whereas Patrocles says 15000 stadia. Both call the breadth of India 20000 stadia,(i.e. Eratosthenes and Megasthenes) but Patrocles states 12000 stadia. 2.1.12 Southern capes of India rise opposite Meroe (i.e. 16 25’N). From the south of India to the mountains there are 30000 stadia2.1.14 Taprobane; Large island off India to the south, it stretches in the direction of Ethiopia for more than 5000 stadia. 2.1.20 Strabo states, impossible that Meroe and Capes of India are on same parallel. 2.1.22 India is rhomboidal in shape, having four sides, two washed by the sea (south and east), one the mountains and the fourth a river. 15.1.11 The west side of India (Indus River) is 13000 stadia. The East side of India is 13000 stadia plus 3000 stadia for the Capes. Those are the maximum and minimum breadths. The lengths are 16000 stadia and 16000 stadia plus 3000 for the Capes. Diagram 1 illustrates the measurements as above and the accuracy with which they accord with the geographical plot, when a stadion of 157.5 metres is utilised. A full text named ” Cp1,Eratosthenes, Hipparchus and Strabo: Geographia. The length of the oikoumene measured on an aslant alignment”8, has an explanation of that stadion which is, as stated, 157.5 metres and comprises 350 Remen, an Egyptian measure. If map 10 of Codex Lat V F 321 is studied, or a new map as indicated on diagram 2 is drawn using the co-ordinates of Book 7, chapter 1, the Indus Delta is situate at 20N, 110-113E and the Ganges Delta 18N, 145-148 30’E. The two degrees latitudinal shift reflects reality in that the Indus Delta is geographically 24N, 68E and the Ganges Delta 22N, 88-92E. The calculated MT/CP distance is thus 38° 30’ x 472.76 stadia or 18200 stadia of 0.184KM. This is vastly over distance, as the geographical measure is only 240 x 556 stadia or 13344 stadia of 0.184Km. It is in fact an expansion of 10° 16’ geographical. If Marinus the Tyrian was so zealous in his search for information, as Claudius Ptolemy informs us in Book 1, chapter 6, and Eratosthenes had established the length of India intra Gangem as 16000 stadia, why was it increased to 18200 stadia? There is a surprisingly simple explanation. By using either Map 10 (Codex) or a newly drawn map as discussed above, the actual coastline length proposed by MT/CP can be established. From the Indus Delta to the Ganges Delta, using in fact both maps as a check/balance, Codex Lat V F 32, indicates 10 degrees of Latitude measuring 92.5mm. The basic longitude measure for the map coastline is at 19N where a degree is 472.76 stadia. Thus any length in millimetres can be converted to stadia. The measured length is c675mm or 34500 stadia of 0.184Km. In order that an accurate measure was produced as a check, the MT/CP plot was drawn to a scale of 1:6000000 and the coastline length measured again so that it could be compared with an Atlas map of the same scale. A larger scale is entirely unnecessary as the comparative accuracy could not be confirmed owing to the geographical coastline indicating each nook and cranny on a large scale map. This is not what the text, data or maps of MT/CP are capable of indicating. The length when computed was 1065mm which calculates to 34730 stadia. Eratosthenes determined the length as 35000 stadia. Thus it can be fairly assumed that Marinus the Tyrian took Eratosthenes’ measure of 35000 stadia as the coastal length of India, completely mistook the length of the Stadion used, if in fact it could have been assessed, and led Claudius Ptolemy, with his reduced length and breadth of the oikoumene to contort the final coastline plot. The contortions of the coast of India thus are the product of those two errors, and the extra ordinary length determined by that coastal measure. Having drawn an MT/CP plot to a scale compatible to an Atlas map it is possible to mark off on a thin cotton each and every point on the MT/CP map by following the coastline precisely and then overlaying the same cotton onto the Atlas map and establishing what may have been the origins of the MT/CP places so named. Diagram 3 indicates this overlay and each GREEN DOT is the corresponding marker for Ptolemy’s Book 7, chapter 1 list of 89 positions as they could be placed. Using information from travellers and voyagers9 Eratosthenes in the 3rd century BCE established the correct distances for the rhomboid of India. In the first century of our common era Marinus the Tyrian misunderstood the measure utilised and led Claudius Ptolemy in his Geographike Hyphegesis to produce contortive shapes to territories which could easily have been avoided if only they had both, (MT/CP,) ascertained the correct length of a degree of Latitude. The 115 parts are in fact the sum total of 360 + 270 + 520 or parts. Thus India has an assigned length, not a natural or geographical length. Then the coastline is added, 35000 stadia long, but limited to a latitude of 11N and not the true latitude of 8N. The fact that Eratosthenes’ stadia is, or may be at variance with the stadia of MT/CP appears not to have been considered. Claudius Ptolemy having established that the length of the oikoumene should be no more than 180 degrees has thus been forced to make major contortions to the landforms when constructing the map of India extra Gangem and Sinae, as described in Book 7, chapters 2 and 3. But this is territory which Eratosthenes did not map or measure and thus it is expected that the stadion of 0.184Km will be used and can thus provide a direct measure for the overall coastline. As before Codex Lat V F 32, map 11, India extra Gangem and Sinae was utilised as well as a newly drawn map of comparative scale to the Atlas. 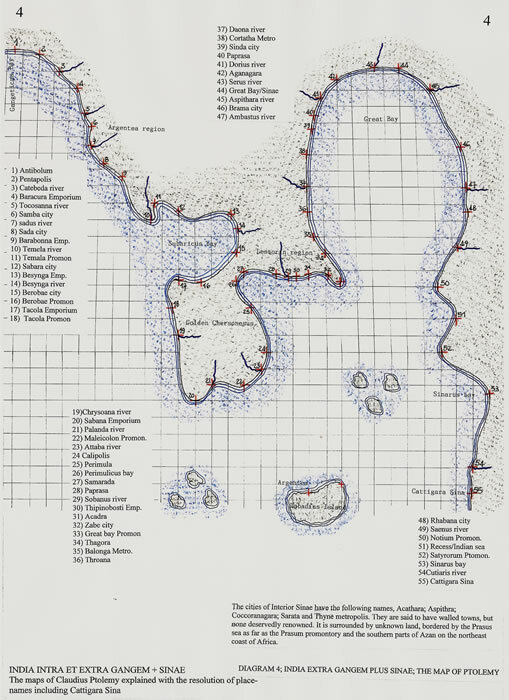 But here there was found to be a major problem with the Codex map as drawn. This map includes the equatorial line which should enable the scale to be measured quite accurately, and should be coincident with the latitudinal side bar scales. The equatorial line covers 45 degrees from 135E to 180E and measures 330mm, thus each degree is 7.333mm. The side latitudinal scales measure 37 degrees and equals 240mm or 6.486mm per degree. The north scale bar is 45 degrees measuring 230mm, which if calculated at the 37N latitude should use 400 stadia per degree, and thus from the equatorial scale be a length of 263.5mm. The side note appended to the map confirms the measure of 400 stadia (or 50 miliaria), which would be equally acceptable at 36N. Thus unfortunately this beautifully drawn map, map 11 Codex Lat V F 32, has errors which preclude its use in a proper comparison. The re-plot of the map, as diagram Cp3D04 indicates, produced a length of 5050 stadia or 930Km. Again a cotton thread was used to trace the coast line of MT/CP, marking each point and the thread transferred to the Atlas map for comparison. This is as diagram 5, and again each GREEN SPOT indicates the position of a point in the text of MT/CP and the coincidence of major harbours on both plots. 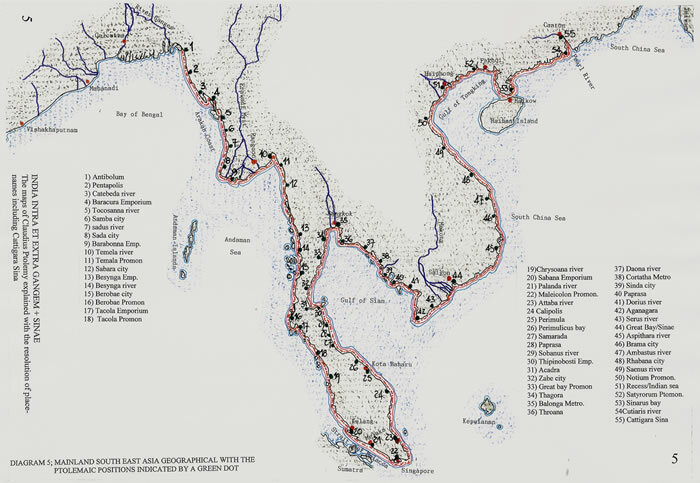 It is clearly indicated on diagram 5 that the coastal length from the River Ganges via Singapore, Bangkok, the Mekong Delta and the Gulf of Tonkin ends quite accurately at the Chinese city of Canton on the Pearl River. Cattigara Sina, roadstead, 177E, south 8° 30’ is thus none other than Canton and its roadstead harbour on the Pearl River. Canton itself was a major port of the eastern Han Dynasty, and when a new flowering of that dynasty occurred around the BCE/CE period and overseas trade followed, Nan-Hai, as Canton was then known exported silk to the Roman Empire. The roadstead, unusually mentioned by Ptolemy is a reminder that the harbour is shallow and large vessels would use Whampoa, some 16 Km below Canton. A striking feature of Canton is the fact that it is surrounded by a wall some 9Km in circumference. Thus the descriptive text by Ptolemy, as diagram 4, is confirmed. Canton is situate at 23° 10N, 113 10’E, but situate at 19N, 110E is Hainan Island. This a most fruitful island is full of natural resources such as titanium, manganese, tungsten, bauxite, molybdenum, cobalt, copper, gold and silver. Its agricultural produce is commensurate. The island has been settled for some 3000 years. Coincidence or not, Gold is available as well as Silver, the capitals name. Thus it is possible to opine that the coastal voyage from the Ganges to Canton was well known and measured quite accurately. The fact that Claudius Ptolemy was required to draw a fictional coastline because of his pre-conceptions regarding the size of the planet and length of the oikoumene did not stop the actual measurement of the coastline being accurately portrayed. This is despite the fact that Claudius Ptolemy has at times arbitrarily altered the measurements given by Marinus the Tyrian. In fact this coastal measurement system is the mainstay of the MT/CP data for constructing their world. This is fully described in Book 1, chapters 9 and 13. However Book 1, chapters 13 and 14 require to be analysed in depth to ascertain the contrary statements and the obvious mis-understanding of the data they have uncovered. After the promontory called Cory, which closes the bay of Colchis, he says that the bay of Argaricus is next, and that it extends to the city of Curula, a distance of 3400 stadia. He adds that the city is situated north of the promontory of Cory. 2. The shore of the Gangetic bay he places at a further distance of 19000 stadia. 3. From Palura to the city of Sada is 13000 stadia by navigating the aforesaid bay toward the equatorial rising of the sun. 4. Thence from Sada to Tamala is 3500 stadia in the direction of the winter rising sun. 5. Next from Tamala to the Golden Chersonesus is 1600 stadia toward the winter rising sun. 6. Apart from the obvious error in 2) which should be summer rising sun, the data can be unpicked and resolved. Diagram 6 has the above data presented in linear form to explain the text and thus indicates the continued use of the Eratosthian stadia of 157.5 metres. The distances are misquoted, or at best mis-understood, and indicate a lacking of attention to detail in that having explained so much in chapter 1, Claudius Ptolemy does not adhere later to the distances and information he is, at some length, explaining. Reversing the text order, the distances from the Golden Chersonesus, using a stadion of 0.184Km there is an excellent match to the coast line to the Ganges Delta. From this point, travelling westerly Ptolemy has two cities named Palura, However, one is circa 9450 stadia of 157.5 metres, the Eratosthian stadia distant, and then a further 3400 stadia distance does in fact produce a match for Curala, possibly now called Cuddalore. This point is certainly at the end of the bay formed by the coastlines of both Sri Lanka and India. The comment concerning 19000 stadia can be taken as applying from several points , but it does actually match the totals of the east coast of India at 13000 stadia plus the two three thousand stadia distances of the “capes of India” within the text of Strabo. By using units of measure provided by Marinus, 13000 stadia, we can equate this to 20 days’ sailing, and thus from the Golden Chersonesus, at 650 stadia per day9, the end point would be the eastern fringe of the Gulf of Siam and the start of the Mekong Delta. At this point is the archaeological site of OC EO10, an important city in the 1st to 7th centuries CE. Excavations show a busy port area and finds include Roman coins. The distance to Cattigara is then in the order of a further 13000 plus 3400 plus 1600 stadia as has already been measured from the Ganges delta to the Golden Chersonesus. That is a further 28 days’ sailing even with adjustments by Claudius Ptolemy. That there is a confusion of distance measures, with many exhibiting the same figure, comes as no surprise. This is apparent in the whole text as has been previously shown. ‘Well, then, let us pass on to the country that rises opposite to the Cinnamon-producing Country and lies toward the East on the same parallel. This is the region about Taprobane. We have strong assurances that Taprobane is a large island in the open, which lies off India to the south. It stretches lengthwise in the direction of Ethiopia for more than five thousand stadia, as they say;—. Now if we assign to this island a breadth that is proportional to its length, and if we add thereto the expanse of the sea between it and India, the sum would be a distance of not less than three thousand stadia – as much as the distance from the border of the inhabited world to Meroë – that is, if the capes of India are to rise opposite Meroë; but it is more plausible to set down still more than three thousand’. If we study the text of Strabo, ‘15.1.14-15’, the island of Taprobane is either eight thousand stadia, or five thousand stadia in length, and a seven days’ sail or a twenty days’ sail from southern India. We are told by Strabo, quoting Onesicritus, there are other islands between Taprobane and India, “though Taprobane is the furthest south”. The text here is virtually the same as in Pliny, book 6.8112, that the island of Taprobane is located within the Eastern Sea, ‘and stretches along the side of India from east to west’. He also confirms that it was once thought of as being a twenty days’ sail, but now has been fixed at seven days’ sail, ’with reference to that covered by our (Roman) ships’. However, Pliny12 also states in 6.86-7, ‘The nearest promontory in India is called Coliacus, four days’ sail away – passing, in mid-voyage, the Island of the Sun.’ And, in 6.88 we read, ’The envoys also informed us that the side of Taprobane facing India is 12800 stadia (1250 miles or 2011Km, from the translator) long and lies south-east of India. Thus we may conclude that the Island of Taprobane, which Onesicritus, an Admiral in the Navy of Alexander the Great proved was an Island, is not the same island as is being discussed above. It is in all probability Sumatra. But, could it be that the ‘Island of the Sun’ is in fact the Sri Lanka of today? Claudius Ptolemy places an island off Cory Promontory between India and his Taprobane, calling it Cory Island. Then gives Taprobane a length of 7500 stadia, and a coastline of 25780 stadia, which is c75 percent of the length of the coast line of India intra Gangem. The island is almost a continent. Diagram 8 compares same scale plots of three islands; Madagascar, Sumatra and Ptolemy’s Taprobane. The coastline lengths are noted as 23700, 22500 and 25870 stadia. Madagascar is in the southern ocean and is possibly marked by the Ptolemaic co-ordinates for Prasum Promontory, given as 80E, S15 00’. However Sumatra is closer to the east/west orientation stated, and is a 7 days’ sail from India. This research has led to the conclusion that there has been a conflation of data regarding Madagascar and Sumatra; Madagascar has the Magnum Littus and Sumatra the thousands of Islands. They are both of a size to be easily mistaken for each other and in description are similar also. What is evident is that the island of Taprobane given the details written by those ancient geographers was never Sri Lanka. 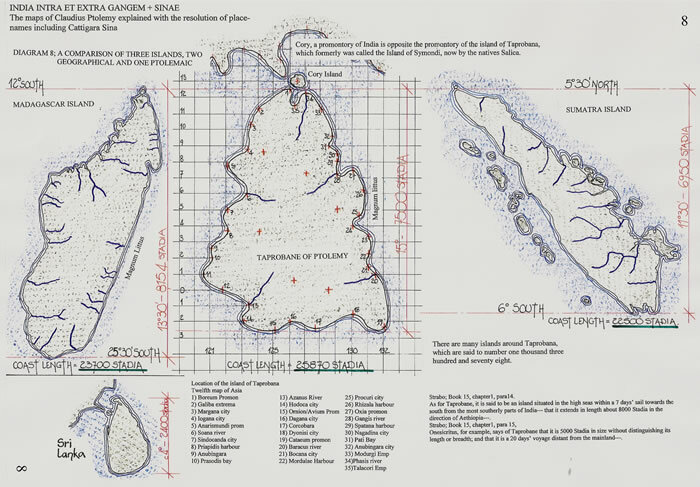 Cory Island would be applicable as Sri Lanka, as diagram 8 indicates in the size comparisons. Marinus the Tyrian was diligent in his researches into previous geographers’ texts and generally interpreted the data correctly. However, in reading either the text of Eratosthenes or that same text as incorporated in the text of Strabo, failed to recognise the fact that Eratosthenes’ stadion was not the stadion in use during his lifetime. Thus in portions of his work there were conflicting distance measures. Claudius Ptolemy, then deciding to take the work of Marinus the Tyrian and literally rework it to form his own text, not only failed to recognise the same fact but also failed conclusively to determine the exact length of a degree of latitude. Thus the scene was set for a monumental blunder; the world was reduced from an accurate 252000 stadia of 157.5 metres to an in-accurate 180000 stadia of 184 metres. Thus Claudius Ptolemy was led to limit the oikoumene to 180 degrees, expand the Mediterranean Sea by a ratio of 115/93 and then expand the coastline of India intra Gangem by 150/115. By setting a limit, quite arbitrarily, for the oikoumene at 180 degrees east, the coastline of India extra Gangem and Sinae was destined to be as distorted as the coast of Britannia at Scotland, and the Mediterranean Sea lands. There was then the mistaken identity of Taprobane, perhaps a conflation of both Madagascar and Sumatra, to finally compound the errors. But, the details when examined are so very recognisable, confirming the very real and precise measures, no doubt gained from the coastal voyages and original world surveys, and particularly that requested by Julius Caesar11. Had Claudius Ptolemy realised his full potential as a cosmographer he would have investigated the correct length of a degree of latitude. Unfortunately he did not. The second is entitled: The Mediterranean Sea of Marinus of Tyre and Claudius Ptolemy. An investigation of the methodology and distance measures utilised. The third, is entitled, India intra et extra Gangem + Sinae and Taprobane. The maps of Claudius Ptolemy explained with the resolution of place-names including Cattigara Sina. The Geography of Claudius Ptolemy, (trans) Stevenson, E.L. (1932). The New York Public Library. The text is a complete translation, with errors, and includes his measurement of the world. It is given as 180 000 stadia, but the length of the stadia is not quoted, neither is there a cross reference to it. Stevenson, E L. (1932/1991), ‘Claudius Ptolemy, The Geography’. New York Public Library and Dover Publications Inc. New York. Codex Lat V F. 32. Library of Naples. 27 maps published originally in Italy by Orsa Maggiore SpA, 1990 and latterly in England by Magna Books Leicester. 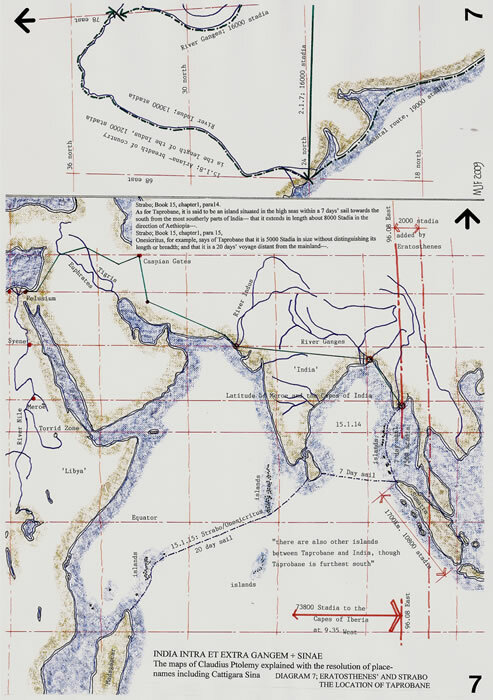 Berggren, JL and Jones, A, (2000), Ptolemy’s Geography. An annotated translation of the theoretical chapters. Princeton and Oxford. 2) The STADION, GREEK or other. Kravath Fred F. (1987) “Christopher Columbus, Cosmographer”, Rancho Cordova, California, quoted in, “Christopher Columbus and the Age of Exploration, An Encyclopdia,” (edit,) Silvio Bedini, Da Capo Press, New York, 1998. P233. Engels, D. (1985), ‘The length of Eratosthenes’stade’, American Journal of Philology, 106: 298-311. 3) Ferrar, MJ, 2009, “Claudius Ptolemy: Falsification, Regimentation or Symmetry. The Cartographical Journal ? 4) Ferrar, MJ, 2009, The Mediterranean Sea of Marinus of Tyre and Claudius Ptolemy. The Cartographic Journal ? 5) Ferrar, MJ, 2009, The text of Marinus the Tyrian and Claudius Ptolemy, Geographia, Book 4, Chapters 1,6,7 and 8. 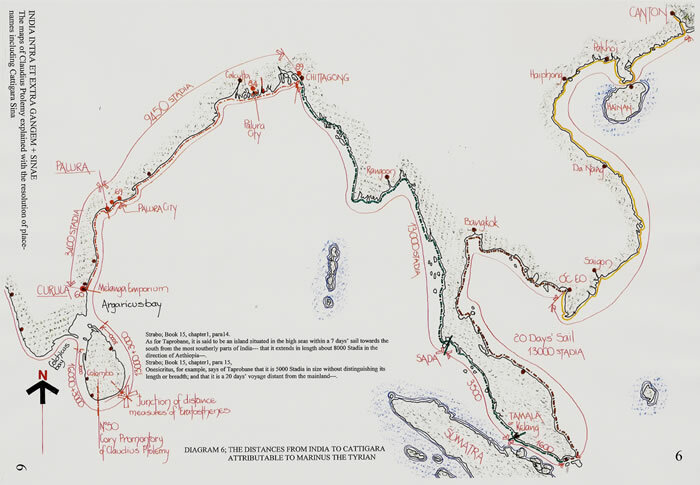 Tha Cartographic Journal ? Aujac, Germaine. in The History of Cartography, chapter 10; “Greek Cartography in the Early Roman World”, pp166/67 and pp173/75; “The Map of the inhabited world recommended by Strabo” and discusses the work of Hipparchus. Chapter 9, “The growth of an empirical cartography in Hellenistic Greece”, pp148/60, but see 153/57. Cortesao, Armando.(1969-1971). History of Portuguese Cartography; Coimbra, Junta de Investigacoes do Ultramar-Lisboa, 2 vols. See1:82, where he speculates that Egyptian cadastral surveys may have been available to Eratosthenes in his calculations of the distance between the two points of observation. Rawlins, D.(2008). Eratosthenes lighthouse ploy; Earth radius 40800 stadia: in DIO, The International Journal of Scientific History, vol 14, march, pp3-12. Dicks, D. R.(1960), The geographical fragments of Hipparchus; The Athlone Press, London. Shcheglov, Dmitriy A,(2005), Hipparchus on the latitude of Southern India, Greek, Roman and Byzantine Studies, 45 (2005) pp 359-380. 8) Ferrar, MJ, 2009, “Eratosthenes, Hipparchus and Strabo: Geographia. The length of the oikoumene measured on an aslant line. The Cartographical Journal, ? 9) Arnaud, Pascal. (1993), De la durée á la distance: l’évaluation des distances maritimes dans le monde gréco-romain. Histoire & Mesure Vol. 8 no 3, 225- 247. Paris. Eratosthenes and his predecessors had plenty of nautical measurements: see for example Herodotus on the Black Sea (switching between fathoms, stades, and time measurements—days’ and nights’ sailing— and measurements in stadia. Herodotus, The Histories, (trans), A. de Selincourt and revised by A.R. Burns, Penguin Books Ltd. In Book 4.34, Herodotus commences the section with the words, ’I cannot help laughing at the absurdity of all map-makers-there are plenty of them – and proceeds to describe the known world. 10) Malleret, Louis, (1962,) L’Archeologie du delta du Mekong, Tome troisieme, La culture du Fu-Nan, chapitre XXV, OC-EO et Kattigara, pp421-54. Paris. 11) Roman world survey. Wiseman T P, (1992), Julius Caesar and the Mappa Mundi in‘Talking to Virgil’, section 3, pp22-42, and appendices pp227-230. Univ. of Exeter Press, Exeter. This section discusses the survey commissioned by Caesar and carried out after his death. It took place between 40 and 18 BCE and was finally completed by Marcus Agrippa and Augustus. The data comes from the Mappa Mundi of Hereford, Cornwall and Ebstorf (original now lost). It is recorded in two ancient texts, by Julius Honorius and Aethicus. 12) Pliny; “Natural History”, (trans. H. Rackham), Loeb Classical Library, Harvard and London, 1938. 13) Diller, Aubrey. (1948), “The ancient measurement of the Earth”, ISIS, volume XL pp 6-9. 1 schoene = 2 parasang = 60 Greek stadia or 6.71 miles/ 10.8 Km. 12,000 royal cubits = 1 schoene = 3.9148 miles or 6.3 Km.